Introduced in 2008, the U.Porto Card results from a partnership between the University and Banco Santander Totta, which guarantees better conditions to pursue the mission and strategic objectives of the University of Porto, by encouraging excellence in teaching, research, development and innovation, in culture and heritage value. Access to other services provided by third parties, under special terms. 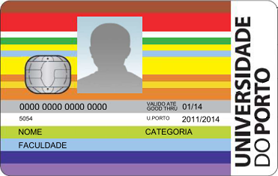 Aiming to encourage the use of the new U.Porto Card, safeguarding the existing functionalities in the different organic units that use the card and the implementation of innovative ones, the Digital University of Porto (UPdigital) is currently studying ways to adapt the different systems to the new card. Additional information about the U.Porto Card Project can be found in the UPdigital Portal. Additional information may be obtained through the e-mail address cartao@up.pt.